Harrogate Town extended their unbeaten start to their first ever season in the National League, beating Aldershot 2-0 away from home. 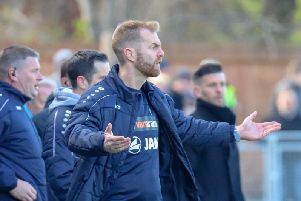 Simon Weaver's men struck twice in the space of four second-half minutes to secure an impressive victory on the road in Hampshire, Dominic Knowles bagging his third of the season shortly before home defender Lewis Kinsella put through his own net. The first half of Saturday's contest was a fairly uneventful affair, but George Thomson did force home keeper Jake Cole to save with his feet as early as the sixth minute. At the other end, a corner found its way all the way through to Dan Holman, however he fired wide of the mark. With the interval approaching, Town left-back Liam Kitching got his head to a Joe Leesley free-kick, but couldn't quite apply the finish. Callum Howe advanced from centre-half and his 30-yarder forced Cole into action seven minutes after the resumption, then, moments before the hour-mark the visitors took the lead. Knowles robbed Shots man Kinsella of possession and advanced into the box, slotting a right-footed strike past Cole into the far corner of the net from a narrow angle. And just as they had done against Barnet in midweek, Town added a second goal within four minutes. Leesley popped up with his third assist of the campaign, sending in a cross in from the left and the ball found its way into the net via a combination of the unfortunate Kinsella and Harrogate right-winger George Thomson. The Shots never really threatened a fightback, but the visitors almost added a third, substitute Aaron Williams thwarted by Cole from Leesley's pull-back, then seeing his follow-up blocked. Town had already done more than enough, however, sealing back-to-back victories and extending their unbeaten start to five games.